The training. The technique. The details. Chef Grant's technique-driven Colorado farm cuisine combines Paris, the South and the seasons. Grant began his culinary career early, as a dishwasher. From this humble spot, he knew the kitchen was where he wanted to be. Quickly working his way up the ranks, he contributed to the finest restaurants in his hometown of Atlanta. For further training, he looked to Paris. At Le Cordon Bleu, Grant received a double degree in Culinary Arts and Pastry Arts, top five in his class on both counts. 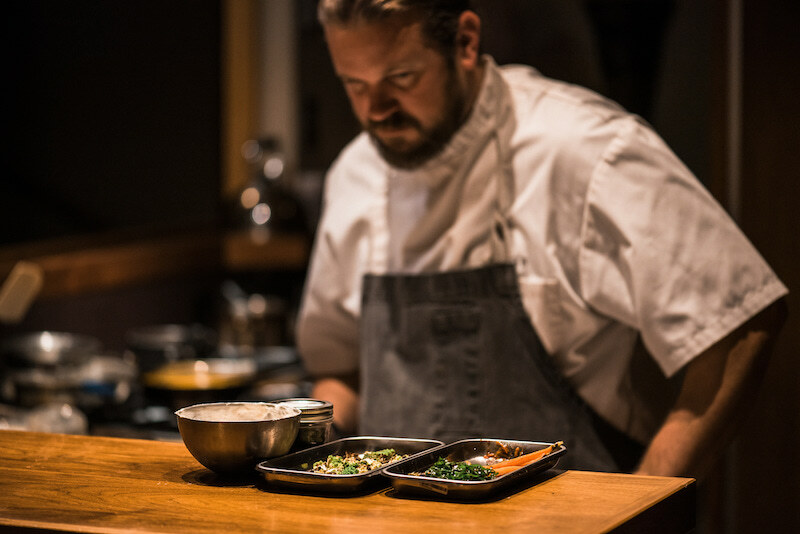 After returning to Atlanta’s French restaurant scene, Grant took the helm as Emory University’s Executive Catering Chef. In creating and executing unique menus for multiple events each day and for groups of over a thousand, Grant excelled. He served as personal chef to Emory’s president, which came with opportunities to cook for notables including Former President of the United States Jimmy Carter, author Salman Rushdie and the Dalai Lama. Grant found his place in the West as Executive Sous Chef for Vail Resorts. For the next three years Grant managed kitchens at a number of prominent restaurants on Vail mountain. Relocating to Boulder County afforded Grant’s intentions for his own business and lifestyle blend. GB Culinary encompasses the skills acquired through a range of experience in varied settings, and its foothills farm promotes the clean, local and organic life Grant and his wife Kaylinn dreamed of in the mountains. From inquiry to event day, you'll communicate each expectation to Claire. Her long-awaited transplant to the mountains scooped a variety of disciplines on its way. From print publications in Nashville, to program coordination and project management in Illinois, to natural foods culinary studies in Massachusetts, to farm internships across the West, Claire makes sure you get the work of a craftsman. A service staff that's professional & warm. Simply a cut above. All members of GB Culinary's regular staff are professionals in their own right. We find it easy to maintain high standards because we share the mindset that there's so much to be proud of. Whether you host an event in your home, office or a third party venue, we arrive on time, unload with care and treat each of your guests as you would. We provide kitchen staff, servers and bar staff, per your vision for the event. Should you utilize an array of vendors, our event managers will coordinate seamless implementation of all goods and services with your chosen partners.